(Newser) – A pregnant British woman convicted of drug trafficking in Laos last year has been handed a life sentence, AFP reports. Samantha Orobator, 20, who was nabbed while trying to board a plane to Thailand, had been found found guilty of trafficking 1.5 pounds of heroin, said a UK embassy spokesman. 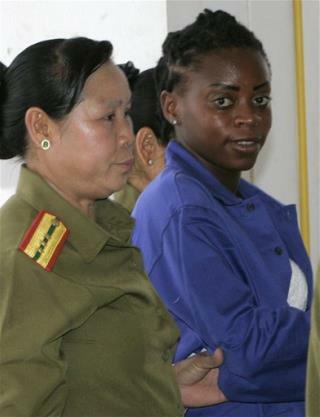 A newly signed prisoner transfer agreement may allow Orobator to serve her sentence in Britain. sure, if she did it. i know there were problems with the Loatian government getting her a lawyer/representation. a one day trial seems pretty quick to me. and let's not forget that she's not the Virgin Mary, and someone did impregnate her in prison. i guess the lesson there is twofold: don't traffic drugs, and don't get stuck in a Loatian prison.